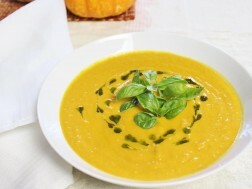 Warm up to pumpkin season with this feel-good Pumpkin Coconut soup! This is an excellent option for any day of the week because it’s made with just a few bold ingredients and can come together rather quickly. A delicious way to harness the goodness in two nutritional powerhouses: pumpkin and coconut, while leaving you feeling cozy inside and out! Vegan, Paleo-friendly, and free of both gluten and dairy. In a medium soup pot, over medium heat, cook the onions, garlic, ginger and turmeric in the coconut oil until the veggies are translucent. Add in the pumpkin purée, coconut milk and stock and simmer for 15-20min. Turn off the heat and blend the soup with an immersion blender in the soup pot until smooth (or, slowly ladle into a regular blender and blend). Season to taste, top with basil or basil oil (optional) and enjoy!